Introduction: Laparoscopic surgery was born with Kelling in 1902, from there this type of procedure was accepted and captivating many surgeons, an important precursor of colon surgery by laparoscopy is Moises Jacobs. 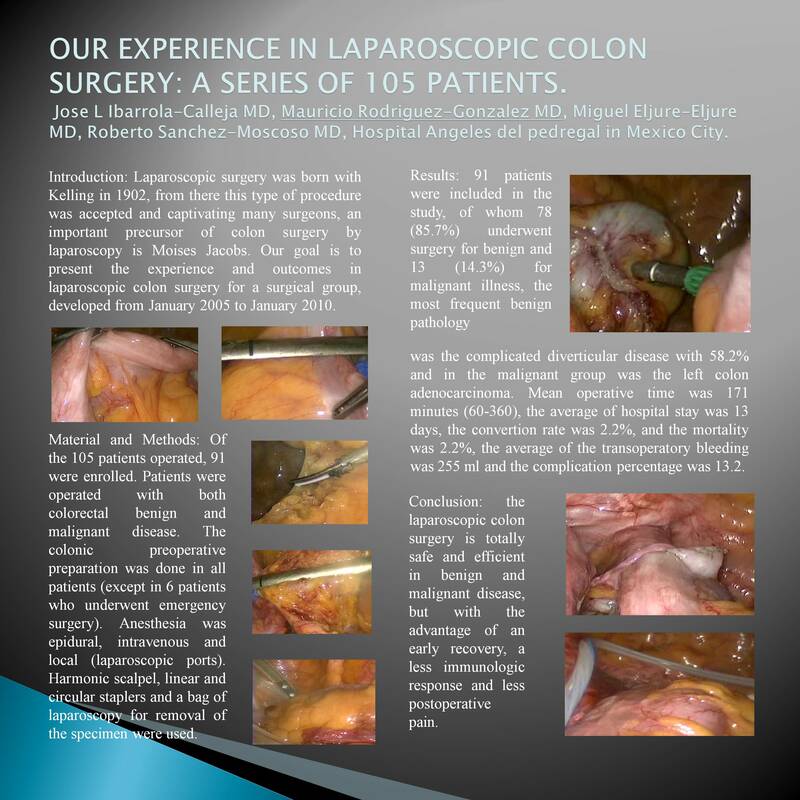 Our goal is to present the experience and outcomes in laparoscopic colon surgery for a surgical group, developed from January 2005 to January 2010. Material and Methods: Of the 105 patients operated, 91 were enrolled. Patients were operated with both colorectal benign and malignant disease. The colonic preoperative preparation was done in all patients (except in 6 patients who underwent emergency surgery). Anesthesia was epidural, intravenous and local (laparoscopic ports). Harmonic scalpel, linear and circular staplers and a bag of laparoscopy for removal of the specimen were used. Results: 91 patients were included in the study, of whom 78 (85.7%) underwent surgery for benign and 13 (14.3%) for malignant illness, the most frequent benign pathology was the complicated diverticular disease with 58.2% and in the malignant group was the left colon adenocarcinoma. Mean operative time was 171 minutes (60-360), the average of hospital stay was 13 days, the convertion rate was 2.2%, and the mortality was 2.2%, the average of the transoperatory bleeding was 255 ml and the complication percentage was 13.2. Conclusion: the laparoscopic colon surgery is totally safe and efficient in benign and malignant disease, but with the advantage of an early recovery, a less immunologic response and less postoperative pain.